To App?? or not to App?? 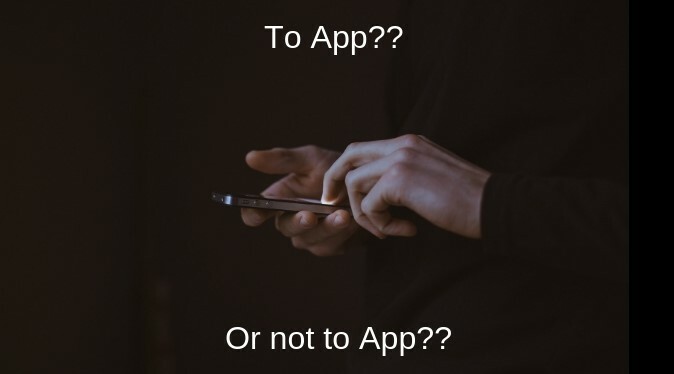 If you market your products or services to people who are particularly tech-savvy or who spend a lot of time on their phones, then they're ready and waiting for an app from you. If they already are fans of your content on social media platforms, then an app gives them more of what they already love. Why give your competitors an advantage? If they have one, surely you don't want to be behind the curve, losing your customers to them? You want your customers to be engaged with your brand. Creating an app is a great way to facilitate that engagement. Use your app to create a loyalty program that rewards app subscribers for purchases — which in turn motivates them to make more purchases. If you want to be really high-tech, let your customers pay from your app to speed up transactions. With an app, you can push notifications of special promotions, sales, and offers directly to the people who are most likely to take advantage of them. When you connect with your best customers this way, you provide real value. For many businesses here in our region, having an app is a great way to boost customer engagement and keep your company visible to your potential customers. We encourage you to use tech to keep your brand and our entire community moving forward. © Copyright 2019 White County Chamber of Commerce. All Rights Reserved. Site provided by GrowthZone - powered by ChamberMaster software.